We are the Polish distributor of a special polyethylene wrapping net. This system of tree packing constitutes an invaluable aid at each stage of sale – from felling trees on the plantation, through wholesale trade and retail sale to individual transport to customer’s house. – reduction of costs and facilitation of transport – the wrapped trees need less space, which makes transporting them easier and cheaper. This is a great advantage for both wholesalers and retailers. 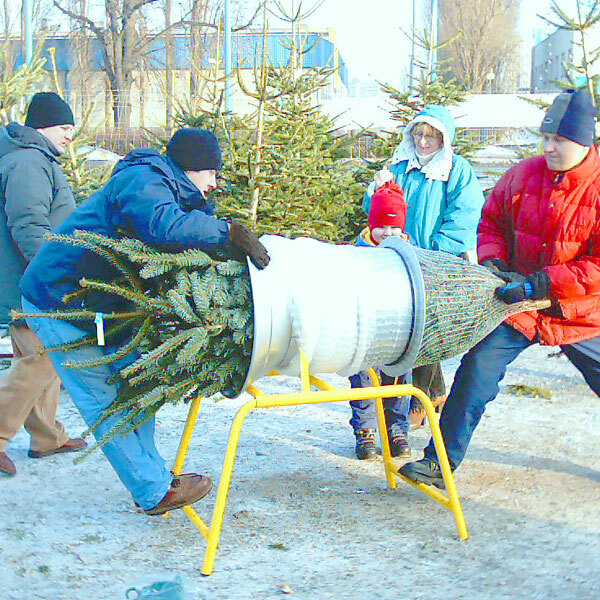 – increased security – wrapping the trees blocks their branches and reduces the risk of breaking them in transport. – easy wrapping – as the net is in the form of sleeve, which is put around a special cylinder, wrapping a tree is a child’s play. 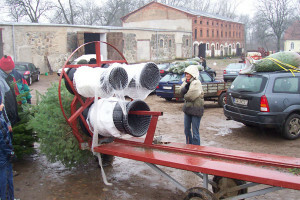 The net is put around a special cylinder, through which the trees are pushed. In reatail sale this process is done manually. In wholesale, however, the process of wrapping is automatic. We build special machines which help to effortlessly pack large numbers of trees in very short time. Please, refer to our offer to learn more about the automatic wrapping machine.